It’s hard to believe the circus going on in Washington. All I can feel is complete and total disgust for all parties involved. Every so-called plan put forward to raise the debt ceiling at the cost of complete cuts in essential programs is more draconian than the last. Regardless of what Obama said, ordinary people have been forgotten altogether. Obama’s biggest mistake was to suppose he could placate the conservative fanatics by meeting them more than half way. On every single occasion he has concede ground getting further and further away from the ideas that brought him to office. When you desire to win at any price, you sell your soul to the devil. Of course, in their own destructive way, the Republicans have done exactly the same thing. Hence the disgust. 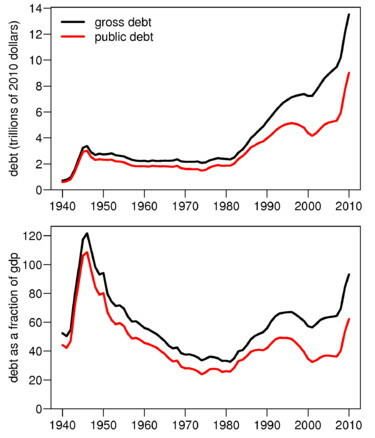 The debt ceiling is an enduring problem for presidents. It’s been around since World War I, and ever since Presidents who went to war or battled economic depressions have gone deeper into debt. It’s not as if the country’s finances can be balanced the way families sometimes balance their budgets at the kitchen table making sure that incomes cover costs. In America we’ve gotten into trouble in the last 12 years by refusing to save or balance our budgets as individuals and families, thinking that the boom times would never end. Well, George W. made sure they would end by not paying for his wars or his drug benefits and donating beyond his ability to pay to the wealthiest among us and their corporations. Now Republican super conservatives are using the debt ceiling and risking the US credit rating in a ridiculous effort to fix what they themselves broke. Rather than being responsible about owning up to their own profligacy, they are using this situation as a bludgeon to hit Obama with and hopefully (from their point of view) ensure his defeat at the polls in November 2012. It doesn’t take a great brain to see what happened after 2000. And who knows? With the constant drum beat of Republican propaganda from Fox News, they may actually succeed in bringing down the President. The only trouble is they may well bring down the country as well, proving themselves totally unfit to govern.